There are lots of articles written about the best and top Instagrammable photo spots in New York City– I know, I’ve googled them all. But all of these articles pretty much show the exact same expected photo locations, featuring an iconic New York City landmark, building or bridge. Who Takes all These Photos? But most importantly, none of these “top NYC Instagram” articles show you how to incorporate yourself into these classic photo opps. I find those “perfect” New York postcard shots to be boring, indistinguishable from every other postcard shot. 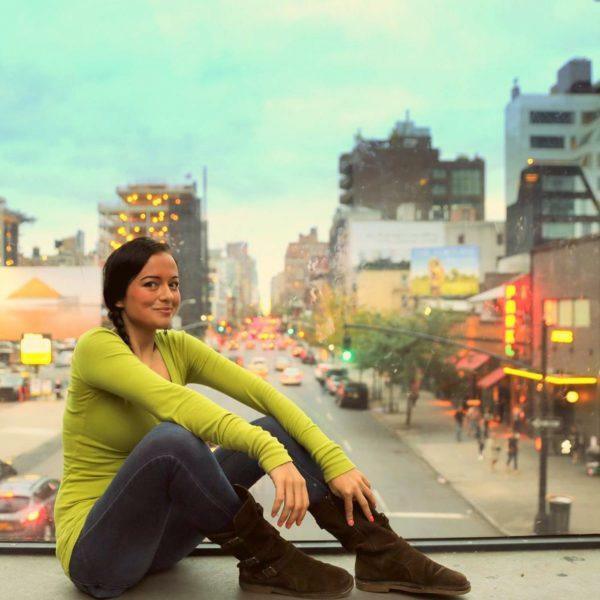 It’s more fun to become part of the photo, adding your own personality and saying yes I was here.But having your photo taken with classic New York City landmarks can be tricky. How do you incorporate yourself in the shot without standing dead in front of the landmark in every photo? And some NYC landmarks simply do not photograph well– I’ve never been able to figure out how to get a good shot with the Empire State Building in it. Incorporating yourself into the shot in an interesting way is usually a matter of trial and error, being creative and having fun with your poses. For more tips on poses, read this post. Ok, I really didn’t pick them. In fact, I didn’t take any of these photos with this post in mind. As a New York City based blogger who’s often slinging my camera when running around the city, I suddenly realized I have accumulated a lot of New York City photos– some for blog posts, some for Instagram and some just for fun. While some of my photos feature NYC landmarks, others are totally under the radar spots, things I’ve stumbled on just from walking the city so much. So I thought it would be fun to compile my most interesting ones together in a post. This list is definitely weighted more heavily to my own neighborhood which borders Central Park, and unfortunately I am totally missing photos from most of the boroughs– but I hope to rectify that and update this post as I get to more areas (right now this post should really be called top 30 photos in Manhattan and Brooklyn). 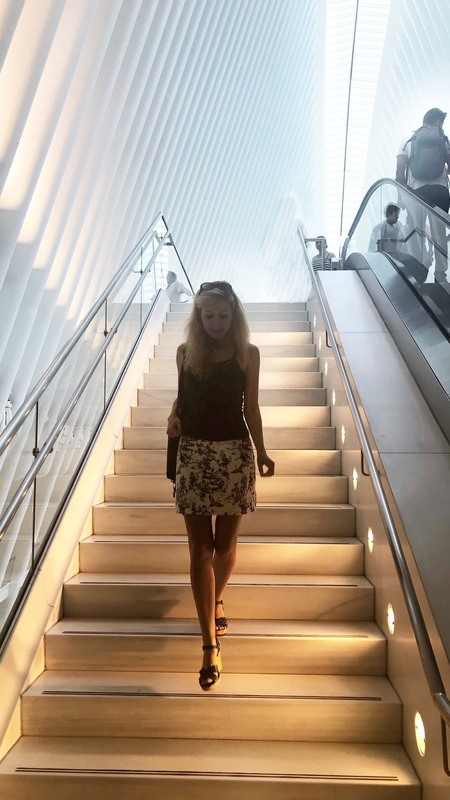 To fill in some of the gaps of those pics I haven’t gotten to yet, I also asked a blogger friend, Anna Kate from the Legendary Adventures of Anna, to contribute some of her own Instagrammable NYC photos. Finally, the number one question people ask me is, “who takes all your photos?” Some of these photos I’ve taken myself (read all about it in my how to selfie post), others I’ve had to plead with friends or even strangers to hit the shutter. And as a blogger with friends in the same industry, I’ve been fortunate enough to sometimes have professional photographers take my picture (thanks Dani, Anna K., Chanel, Anna). The list is thirty today, but will expand, so let me know your favorite NYC shots! Love it or hate it, Times Square is recognizable worldwide, a symbol of New York City. Forget about getting a photo without any other people in it, though you can try to minimize the numbers by shooting at odd hours (really early in the morning) or during a snowstorm, like we did. This entry is totally weather dependent, but if you happen to be in the area and the fountain is running, wading in the Washington Square Fountain makes a great New York City photo. You can’t quite swim in the fountain, given that it’s about a foot deep, but you can definitely kick off your shoes and walk directly under the fountain’s water spout. 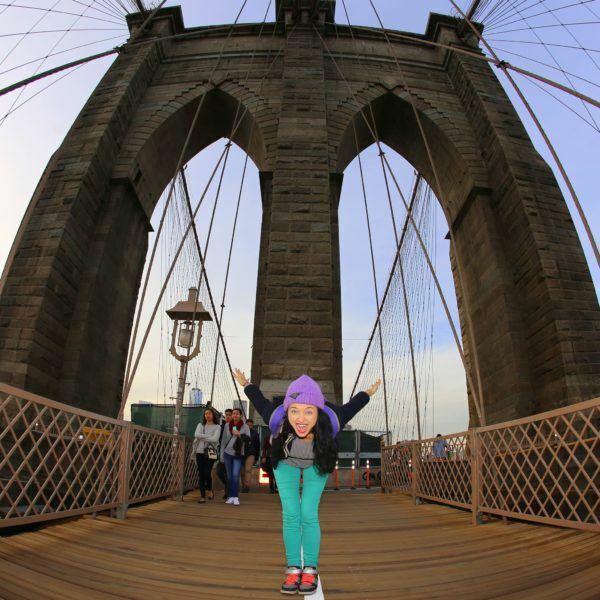 Be warned, Instagramming yourself on Brooklyn Bridge is very popular. Arrive after 9 am and you’ll be elbowing fashion instagrammers for space. Deal with the crowds or just show up early for that perfect shot. 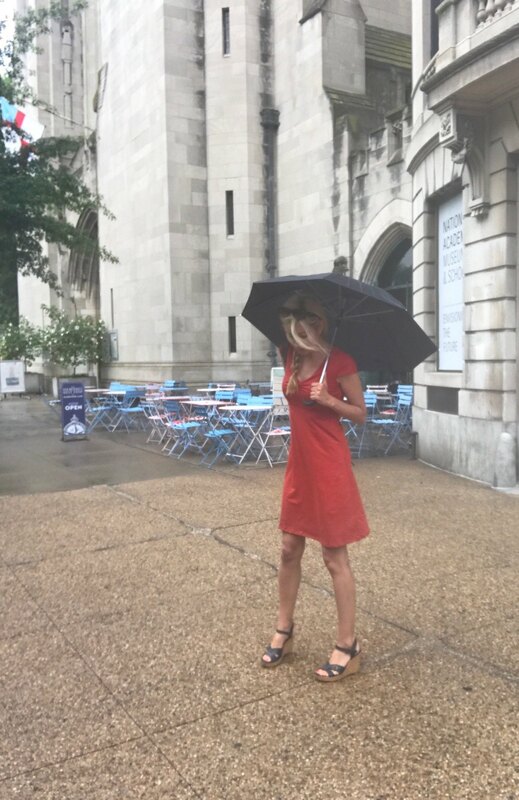 I love Anna’s pose here (follow Anna’s inspirational feed on Instagram @crazyintherain). If Brooklyn Bridge is too crowded or just too refined for you, lesser known but also photogenic is the grittier Williamsburg Bridge. The graffiti and pepto bismol pink rail make for a memorable shot. Anna takes a walk over the Williamsburg Bridge. The Guggenheim has the gorgeous spiral rotunda which is highly instagrammable. But the top of the ramp, I was even more drawn to the unique ceiling that reminded me of a spaceship. Photo Credit: The Legendary Adventures of Anna. 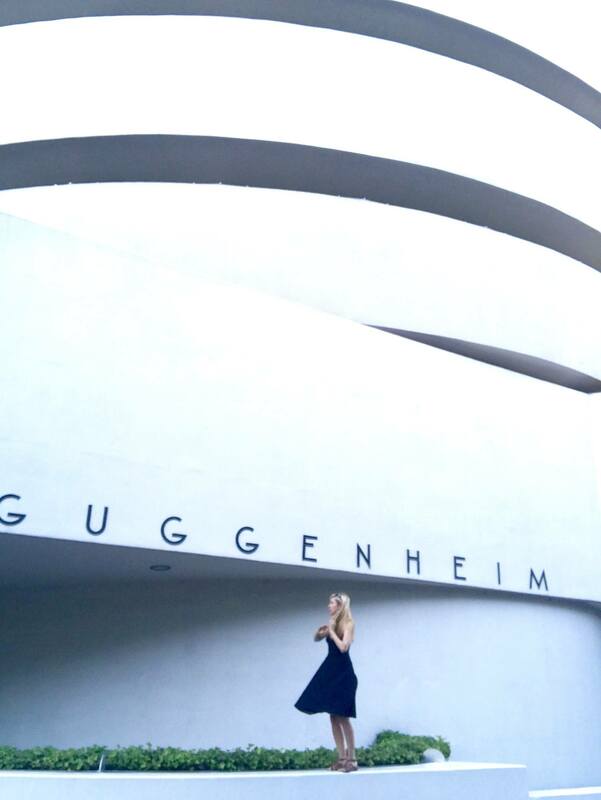 You don’t always need to pay admission and go inside a museum to get a great shot for the gram– the outside of the Guggenheim is even more recognizable than the interior. I hopped on the wall to get right under the Guggenheim sign. Photo credit: selfie. New York City is as much about food as it is photo opps. Why not combine the two? 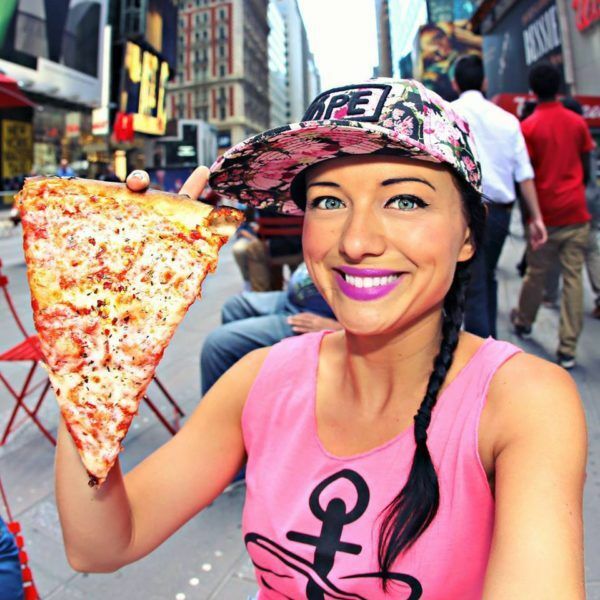 I was thinking a great Instagram shot would be posing with a classic New York City slice of pizza (the typical big floppy kind) and was thrilled to learn that Anna had the perfect shot in her archive, bonus, with Times Square in the backdrop. Photo by The Legendary Adventures of Anna. Can you get any more New York City than this photo? I have seen many a fashion blogger crossing a New York City street to get the perfect Instagram shot. I love these street shots– even though they are clearly staged, nothing says New York like its vibrant streets, a rushed mix of cabs, daredevil bicycle messengers and pedestrians ignoring don’t walk signals. But these street shots can be tricky if not downright dangerous. Forget selfies, you absolutely need a friend who doesn’t mind dodging traffic to get the photo (thanks Meg). If standing in front of traffic at a street light is too risky, consider a side street with less cars (we took this shots early Sunday morning). If you don’t have a daring friend to take your photo or you wisely decide standing in traffic isn’t worth the gram, an alternative shot is take a photo on a New York City sidewalk. There are so many amazing buildings in New York, from Harlem brownstones to Lower East Side tenement buildings to spectacular churches, strolling in front of your favorite makes for a great NYC photo opp. Photo cred: selfie. I selfied in front of a favorite cafe in my neighborhood. The stairs of the Met are nearly always filled with both tourists and locals looking to take a break from the city hustle. This makes it tough to get a shot without a million other people in it. Nighttime is always a good option if you have the right kind of camera/lens and a competent photographer. But if you’re only armed with an iphone, try a shot right after sunrise for a clear view of the Met steps. I didn’t plan to take photos the morning I took this shot (note the disheveled ponytail and hoodie), but when my insomnia woke me up early one morning, I took a stroll in my neighborhood. As I walked past the Met I noticed there was no one on the stairs, so I waited for a passerbyer and asked them to snap a quick pic. Photo cred: random stranger. While most people stand on the highest viewing balcony right in front of the Oculus peak for the classic Instagram shot, it’s usually pretty crowded and I didn’t have the patience to wait for the crowds to disperse. I then noticed the dreamy lit white stairwell leading up to the balcony and thought it would make an interesting shot (even better if I had waited for the escalator to clear on my right, but oh well). Photo cred: random stranger. 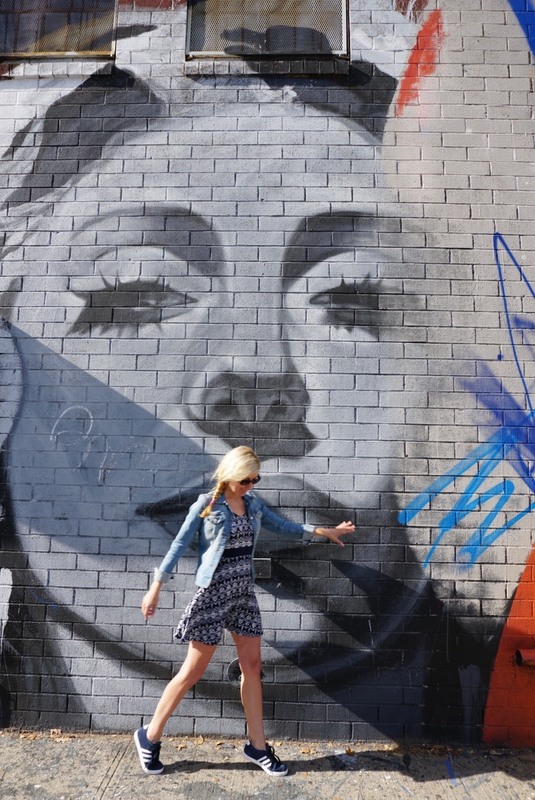 Standing in front of New York City murals is practically a hobby of local Instagrammers. It might be cliché, but it’s still fun. Find your favorite murals (Nolita and Williamsburg are both great spots) and pose away. Bonus: no one will look at you funny because they are likely waiting their turn to do the very same thing. (photo credit: Anna, shots 1 & 2, Globetrotter Girls shot 3). 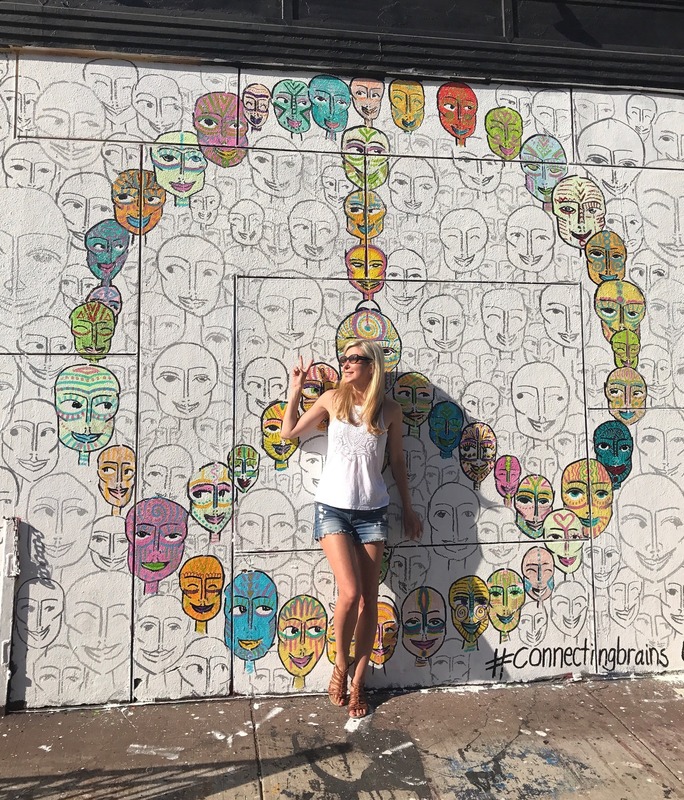 In Nolita, making a peace sign on the peace sign. 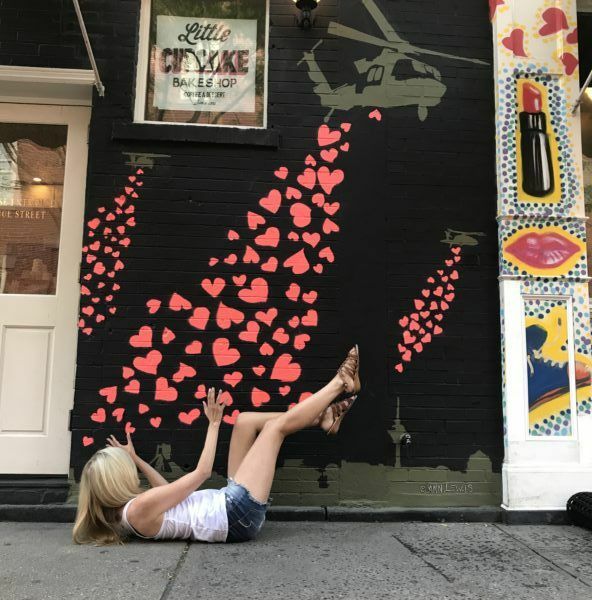 In Nolita, pelted with hearts. 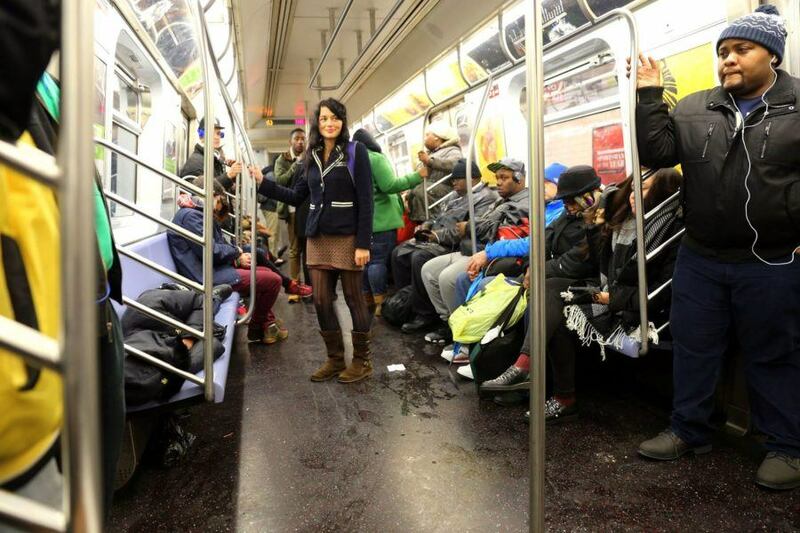 An unexpected but really cool place to Instagram yourself is on the iconic New York City subway. Whether on the subway platform waiting for a train, or better yet in a subway car, not much says New York more than this shot. Photo Cred: The Legendary Adventures of Anna. While you can get great views of New Jersey, Queens and Brooklyn from Manhattan, my favorite skyline views are of Manhattan itself. There are so many places to get Manhattan views (for something different, head to the Jersey City waterfront) but my favorite spots are in Williamsburg, Brooklyn. From the beach in Williamsburg, Brooklyn. Confession: I live next door to the Cooper Hewitt Design Museum but still haven’t actually been in the museum. I do frequent their excellent cafe in the morning and love hanging out in their gorgeous open-to-the-public garden. Photo Credit: Shot 1, Meg R. 2 & 3, selfies. 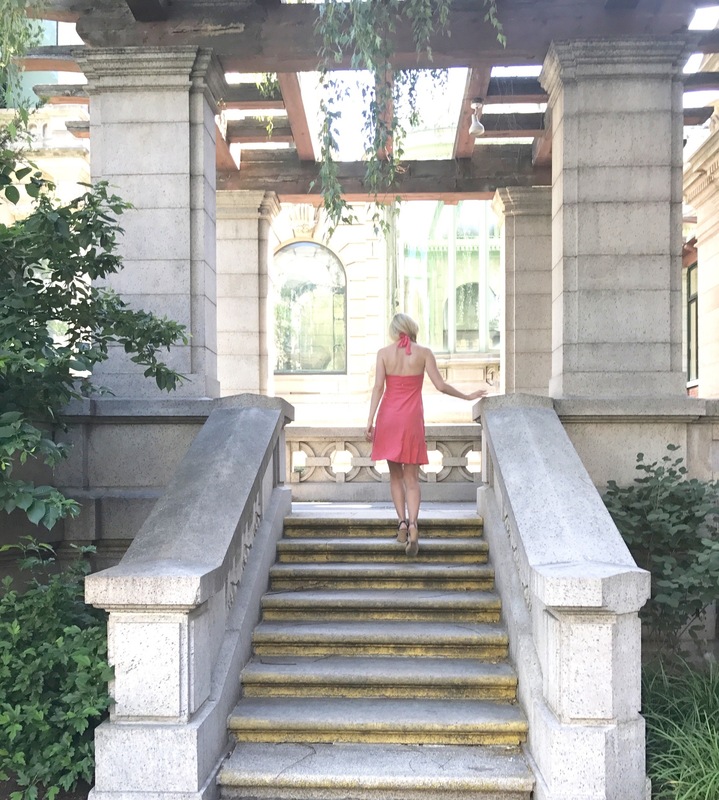 The Cooper Hewitt garden is open year round but is best during the summer when lush and green. This indoor atrium room is next to the museum’s cafe and does not require museum admission to enter. 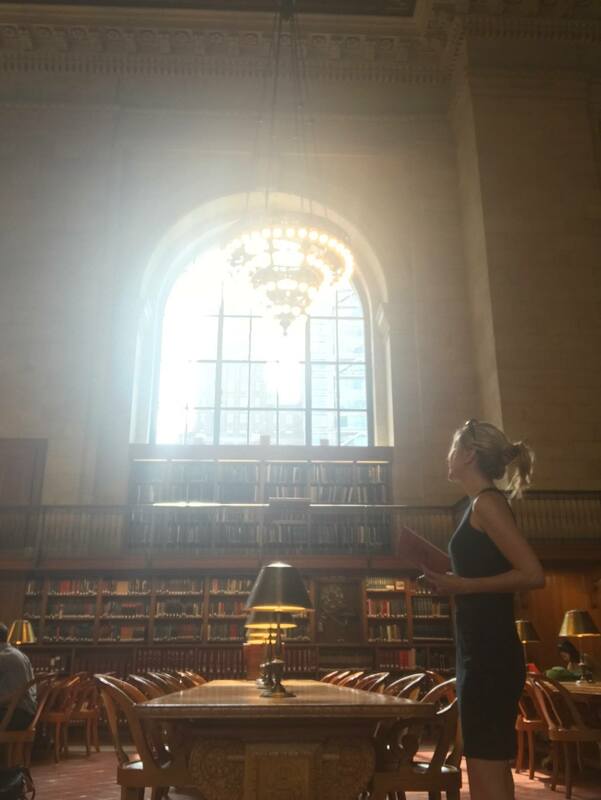 The light here is spectacular and makes for a great Instagram shot. You know those spinny top chairs? I was over aggressive in my spinning technique and kept tipping over so I went with that for a shot (this was a selfie, taken by propping my camera on the nearby ping pong table). Walking the Highline can be a fun experience if the crowds aren’t too thick. But while I’ve done it many times, I’ve never quite figured out where to snap that Instagram shot. Fortunately, Anna has nailed it with this shot– taken on the viewing platform overlooking the street. Photo cred: The Legendary Adventures of Anna. I love everything about this shot– the colors, the light, the outfit. I decided to make this Whitney roof exhibit interactive. 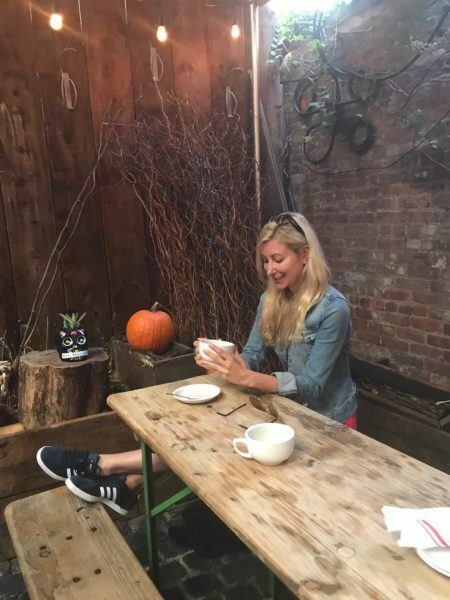 Hands down the most popular place to Instagram yourself in New York City if you’re a blogger is at the trendy cafe of the moment. It might be an all pink cafe, a matcha bar, or any place with a cute sign or faux rustic interior. I went with the all avocado cafe. 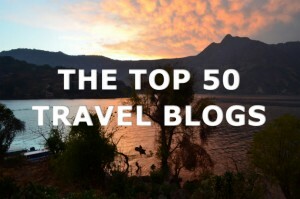 Photo Credit: #1, CulturalXplorer, #2 Alison D.
If you don’t instagram your coffee are you even a blogger? For a completely different kind of museum, check out the Newseum at the Bowery. We had fun shooting these “portraits” there. Photo Credit: The Legendary Adventures of Anna. Since I live across the street from Central Park, I spent a lot of time there. 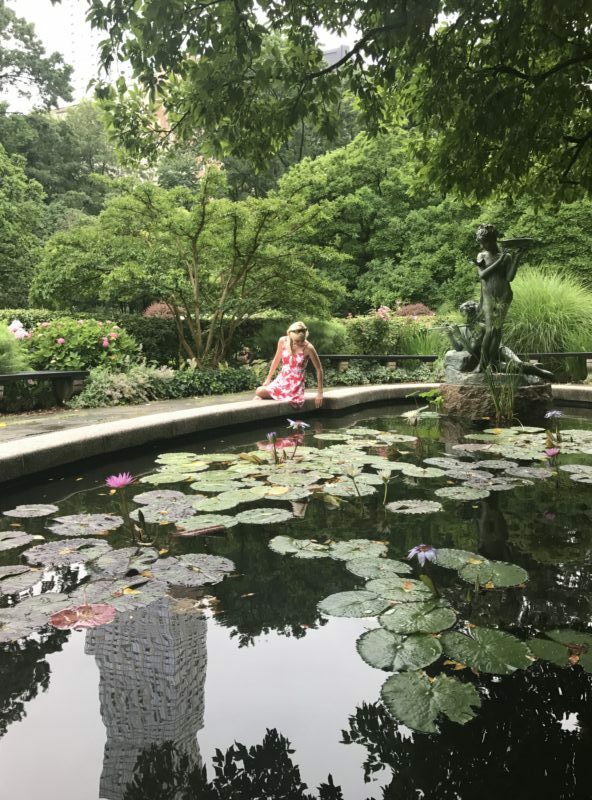 I could fill up an entire post on the best Instagrammable spots in Central Park (and probably will someday!) 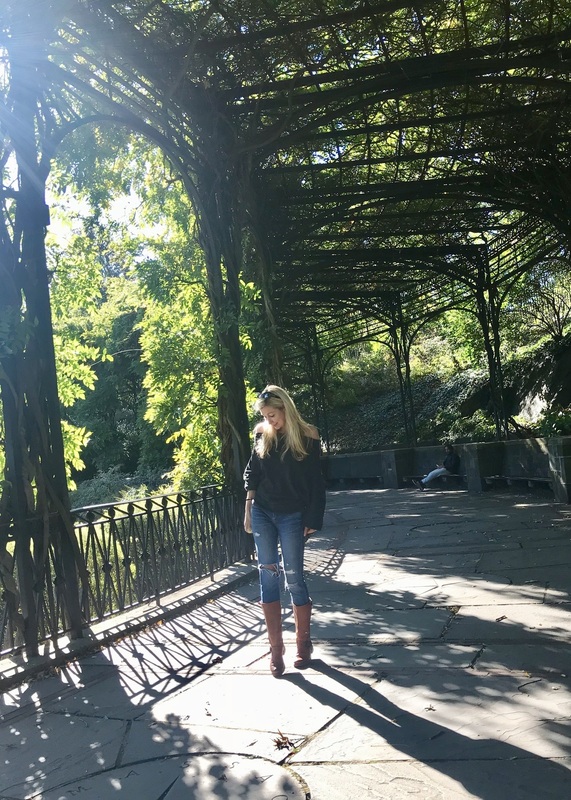 but for now I’ll show you some of my favorite places to pose in Central Park. Some spots are so well known you’ll have to go early to avoid maddening crowds, others are so unknown I hesitate to even write about them here. The dramatic swoopy curves of Bow Bridge makes it one of the most popular places in Central Park, and rightfully so. Even if you’ve never been to Bow Bridge you’ll recognize it as a movie location (too many to mention, but most recently featured in Cafe Society). Forget about getting the bridge to yourself on a nice summer weekend. But if you have time during the week, usually people are walking through and don’t linger that long. You should be able to get a shot like this. If the bridge is chock full of people, you can always get a shot off the side like this. Photo credit: random stranger. I hesitate to do this, but I am going to give away my Central Park secret photo spots. Shockingly, most New Yorkers I asked aren’t even aware of the existence of Conservatory gardens (enter at 105th and 5th Avenue). Under the Wisteria Pergola in Conservatory Gardens. This Lily pond hidden in the center of the English gardens is magical. Photo credit: Anna Everywhere. The Ramble holds my absolute favorite place for an Instagram shot. More wild, woodsy and less manicured than other parts of Central Park, you always feel like you are on the verge of discovering something here. The skinniest bridge in the park has an Indiana Jones like feel. Since I live across the street from one of the main entrances to the reservoir, I take a lot of photos here. hands down this is the best place to get a gorgeous sunset shot. Since there are nearly always joggers on the path, selfies are hard, but not impossible. Photo Cred: selfie. In front of Belvedere castle. Leaf Peeping season, better if random dog runs into shot. 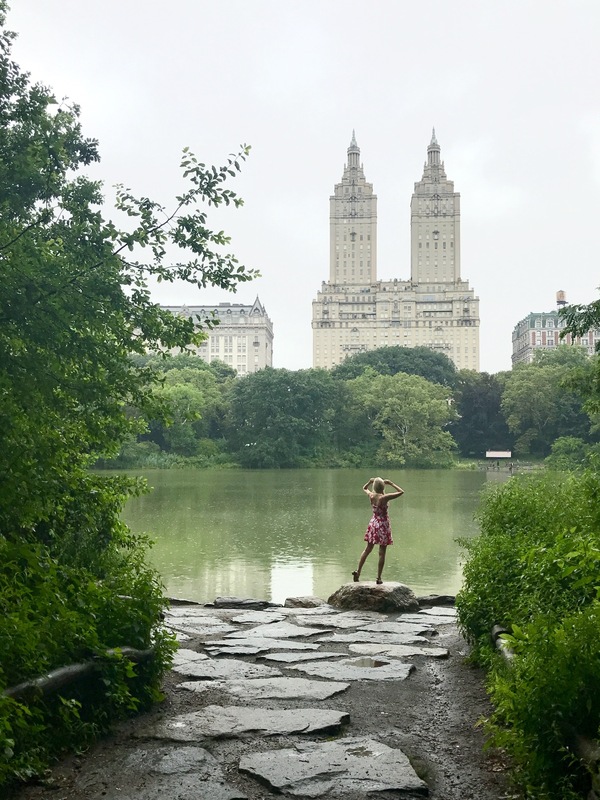 Taking photos in New York City can sometimes be dreary– building are grey, and if you’re not in the middle of the park in the summer, it can be hard to find pretty colors for your Instagram shot. Chinatown, however, is full of gorgeous colors (and yummy eats). 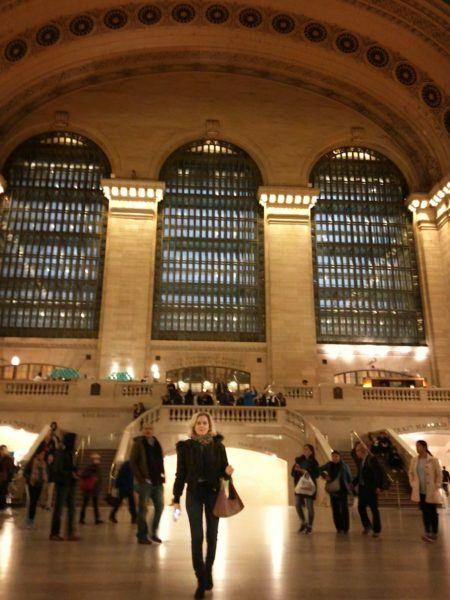 Grand Central is a beautiful location to walk through (head to the oyster bar for an iconic NYC restaurant). I’m not sure you’ll ever get a photo without being photobombed by a zillion people, but we did our best (my friend Alison poses here while I take the shot). Were you even aware that NYC has a city hall? And that it’s spectacularly photogenic to boot? Well now you know. Photo credit: selfie. 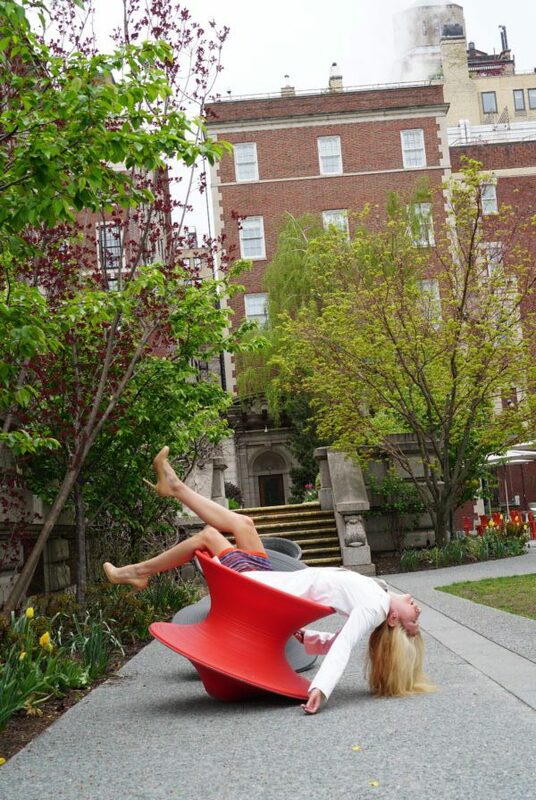 New York City has had some amazing public outdoor art installations over the years. My current favorite is this cool sculpture in Williamsburg, Brooklyn, which can be read OY or YO depending on which side you shoot from. Photo cred: J.K. 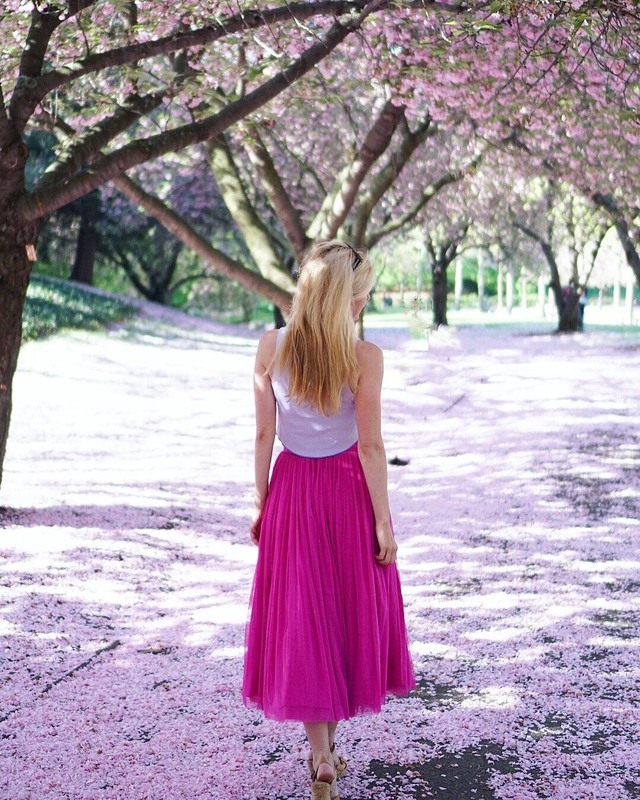 If you can’t make it to Japan for the cherry blossoms, the next best thing is the gorgeous Brooklyn Botanical Gardens during cherry blossom season, it will take your breath away. If you have a chance to see an opera at the Met while in NYC, do it. 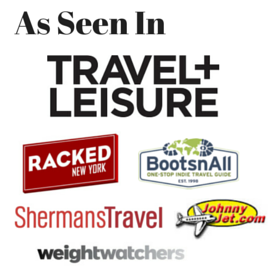 Last minute discount tickets are often available. 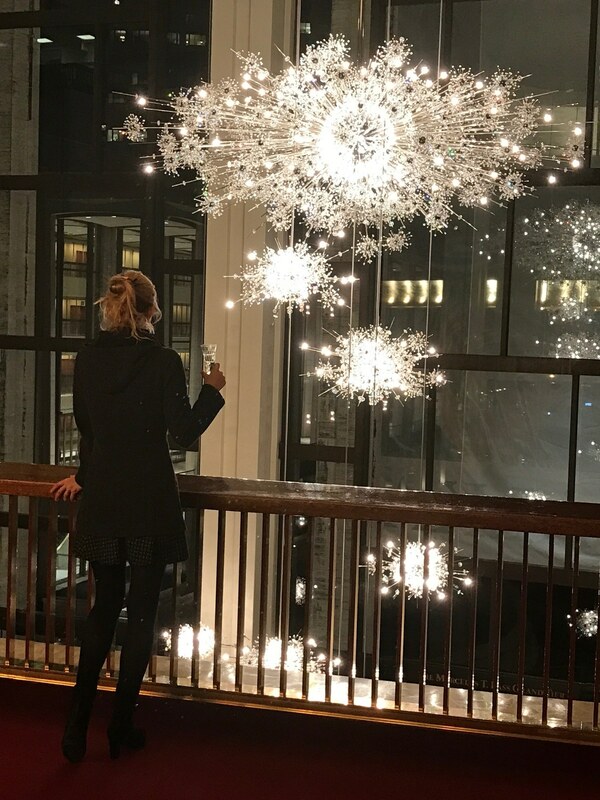 The Opera house’s famous chandeliers are a great spot for your Instagram shot, even better with a glass of champagne. Where are your favorite places and photo opps to Instagram yourself in NYC? Share in the comments! This post took a couple of years to assemble, but maybe someday! What a fun post 🙂 The avocado cafe was a lot of fun! Thanks for your great photos! Avocado shake was delish I’m craving one now!